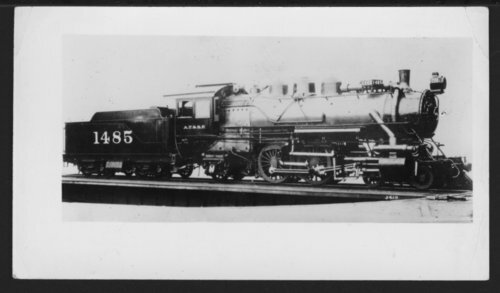 This black and white photograph shows the Atchison, Topeka & Santa Fe Railway Company's steam locomotive #1485, 4-4-2, in Topeka, Kansas. Similar engines were referred to as "Bull Mooses" and consisted of a balance compound. In 1910, the Baldwin Locomotive Works of Philadelphia, Pennsylvania built a prototype for the ATSF railroad.